A new fire engine is being purchased by Lyons. It’s one of three vehicles being purchased by the village. The village board, at its Sept. 18 meeting, unanimously approved buying the three vehicles with the biggest being a new fire engine. It replaces a 30-year-old engine, Fire Chief Gordon Nord, Jr., said during the finance committee meeting before the board meeting. “Thirty years. It’s had a good life,” Nord said. The village bought two new engines in 1989 and replaced one of those in 2006. “Gordy has been very good about reminding us that in 2019 his fire engine will be 30 years old. And that’s not good for emergency purposes,” Mayor Christopher Getty said. The engine, built by Pierce Manufacturing, of Appleton, Wis., could arrive as soon as May 2019, Nord said. “It will be very close to matching our other engine, so the training will be cut to almost nothing. It should be a smooth transition,” Nord said. The new engine is custom made, he said. “We didn’t skimp, but we didn’t go for crème de la crème, either,” Nord said. “We’ve had good luck with Pierce, they stand behind their products, and the service center is in Aurora if we need it. I think we’re getting a very good product for the money,” Nord said. The price tag is $662,883, Getty said. But Lyons can cut that by $19,000, if it pays upfront, Nord said. The village has yet to determine the payment plan. The board is also buying a 2018 Ford Interceptor sedan which will be used by the administration department. Lyons will pay $25,239 to Curie Motors in Frankfort. “It will be used by anyone in the administration or building department that have to go anywhere around town, pick something up, drop something off,” Getty said. “Why are we going with a police vehicle, those are the most durable. When we had three Chevy Impalas, one was a police edition, and we constantly had issues with the two that were not police vehicles,” Getty told the trustees. The village is also buying for public works a 2018 Ford F-150 truck from Curie Motors in Frankfort for $23,507. “It’s nice to have a truck that’s not designated for plowing. It’s more of a scaled-down, all-purpose truck for public works,” Getty said. Lyons’ newest police officer, Roberto Santos, is sworn in by Village Clerk Irma Quintero. Photo by Steve Metsch. In other business, the board welcomed its newest police officer, Roberto Santos, who has graduated Sept. 21 from the Chicago Police Academy. Santos was an auxiliary officer in Downers Grove for six years and worked three years for the Department of Corrections at Stateville for three years, he said. His mother, Joanna Santos, pinned the badge on his uniform after he was sworn in. The board also unanimously approved a $9,000 settlement with Allison Griffin. In 2015, Griffin’s sister was arrested by Lyons police, but she gave them Griffin’s personal information, Getty said. It turned out the sister had arrest warrants elsewhere, he said. She is still wanted, he said. “The officers failed to correctly get ahold of Allison Griffin, who lived out of state and notify her of these pending issues,” Getty said. That led to problems for Griffin when she applied for a job and had a background check that showed an arrest record, Getty said. “She cleared it herself, and said she was going to sue us. We came up with the $9,000 settlement to cover her expenses,” Getty said. The village has had to remove several street lights along Custer Avenue due to resurfacing but is not getting rid of them. The board approved a $47,525 contract with Schroder & Schroeder, Inc., of Skokie for the 50/50 sidewalk replacement program. Residents pay half the replacement cost. 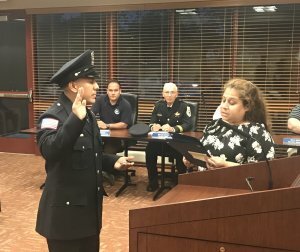 The board welcomed its newest police officer, Roberto Santos, who has graduated Sept. 21 from the Chicago Police Academy. Trustee Dan Hilker is now chair of the finance committee, taking the reins from trustee Paul Marchiori, who requested to step down from the position. THIS POST HAS BEEN READ 3434 TIMES SO FAR. THANK YOU!